Evenflo humidifier filters keep your home's humidified air clean and fresh by using an antimicrobial agent and honeycomb filtration. This Evenflo 655000 Humidifier Wick Filter Replacement has an antimicrobial agent which aids in the efficient filtration of impurities. 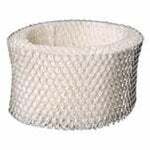 The Evenflo 655000 Humidifier Wick Filter Replacement features Honeycomb filtration.